"Guiding You on the Course to Success"
The Book : Found A Job Yet? And Other Questions Not to Ask! RightChanges providesjob search coach services. Just like in football, the job seeker is the one in the game and on the field; RightChanges does not find the job for the job seeker. Instead RightChanges empowers individuals with the knowledge, skills, tools, and encouragement to find their own job now and in the future. All clients of RightChanges are asked to read and sign a copy of the following Agreement of Principles. 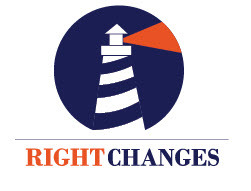 RightChanges provides coaching, feedback, encouragement, fresh ideas, tools, and information on the best practices for the new job market. As a client of RightChanges, I agree that the job search and follow-up is my responsibility. I will complete the scheduled assignments before the next one-on-one session. To be considerate of others, I will notify RightChanges at least 24 hours ahead of time if I am unable to keep a scheduled appointment. The RightChanges materials are Christ-centered. RightChanges serves everyone regardless of personal faith or religious affiliation. RightChanges and Crossroads Career materials are copyrighted. I will not duplicate or provide anyone access to the materials provided to me. We can help. RightChanges offers various packages to meet your individual needs. Act now! The job market is not getting any easier and your competition is already out there. For more information, ﻿Contact Us﻿. Copyright of Crossroads Career Services, Inc.